Sandy beaches, salty sea air, the sunshine on your face, and a glass of wine in your hand. Does that sound like a dream come true? If this is your idea of paradise, the Sandestin Wine Festival and South Walton Beaches Wine and Food Festival are the perfect events for you. Below, we compiled everything you need to know about these two wine festivals on 30A! For more information about Florida’s Emerald Coast including the best places to stay, eat, and play, request access to our free 30A Vacation Guide! It’s the best resource for planning unforgettable beach vacations. The Sandestin Wine Festival encompasses four fun-filled days and is carefully designed to please even the pickiest of wine connoisseurs! Use your commemorative glass to sample as many different kinds of wine as you’d like, and when you find one you love, you can purchase the bottle directly from the winery. While the Sandestin Wine Festival is open to the public, guests may purchase tickets for specific events: The Official Kick-Off Party at Rum Runners, the 33rd Annual Tasting at The Village of Baytowne Wharf, and Mind. Body. Beach. If you’re already a wine collector, there’s no better place than the Sandestin Wine Festival to find some incredible and unique additions! It’s a great place to be surrounded by people who share your passion. If wine tasting a new interest of yours, that’s not a problem at all! In fact, this event is a very welcoming place for inexperienced tasters. This is a great way to try many different kinds of wine and find your favorite varietal. White or red, sweet or dry, this event is the perfect opportunity to refine your palate! Curious about how to pair wines with specific foods? Especially if you’re looking to try a pairing that’s outside the box, you’ll want to bring your appetite to the festival. Attending means you’ll get to enjoy carefully prepared dinners from celebrity chefs! There will also be culinary tents on-site, so bring your questions and enjoy the experience. Held shortly after the Sandestin Wine Festival is the South Walton Beaches Wine and Food Festival! This exciting event is a broader celebration of 30A’s top-notch wine, beer, and spirits. It features a “dazzling roster” of food and beverage celebrities including winemakers, distillers, and chefs. This 4-day lineup features tasting events, educational seminars, live entertainment, and themed attractions. Like the Sandestin Wine Festival, this 30A celebration tickets its individual events (Tasting of Champions, main festival showcase, and Winemakers and Shakers) separately. Check out the ticket portal for more information! The primary difference between Sandestin’s festival and the South Walton Beaches Wine and Food Festival is the Craft Beer and Spirits Jam! For one day of the festival, beer lovers can unite over a smorgasbord of specialty craft beers, spirits, and savory small plates from local vendors. Expect lots of live entertainment, celebrity chefs, and food trucks! This segment of the festival is held in the Town Center and Grand Park. 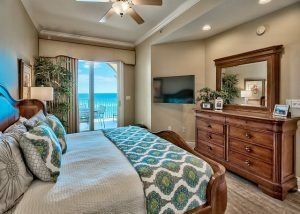 Reserve Your Perfect Home Away from Home on the Beach! There’s nothing quite like enjoying sunshine and wine at these 30A wine festivals, then retreating back to a luxurious condo with your loved ones! We have over 27 gorgeous beachfront condos, each with a spectacular view of emerald green waters and sugar-white sand. Plus, whether you stay in our Adagio, San Remo, or Villa Coyaba condos, you’ll find that you’re just steps away from the beach! We also offer a spectacular concierge service so you won’t have to lift a finger. What are you waiting for? Sip and savor at one of these events, refresh and rejuvenate with a relaxing night’s sleep, and enjoy your morning coffee on the beach. There is truly no better vacation! If you’re ready to start planning your 30A getaway, check our availability today! We look forward to hosting you very soon. Like the idea of attending these wine festivals on 30A? Then you’ll love reading about more of 30A’s best events (like the Baytowne Beer Festival)!